Soleanna Castle Town is an Adventure Field in Sonic the Hedgehog (2006). The main overworld area of the game, this area is an important hub for shops, Action Stage access, and Town Missions. The historic heart of the nation of Soleanna, Castle Town is a Venetian-themed city with wide canals, stately bridges, and lots of Mediterranean-style buildings and plazas; fountains, cafes, and boutiques abound. The palace of the Soleannan royal family lies on an island just offshore. It is in Castle Town, during the Festival of the Sun, that Sonic saves Princess Elise from Dr. Eggman in the opening cinematic. The area connects to the Soleanna Forest Adventure Field to the east. 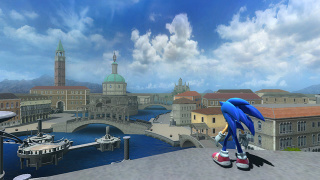 Wave Ocean and Dusty Desert can also be entered here, as well as Aquatic Base at the end of Sonic's story.